Lying on banks of the Ashtamudi Lake, Kollam is the gateway to the amazing backwaters of Kerala, which comes lauded as the God’s own country. An old seaport city on the Laccadive Sea, Kollam, the third largest city in Kerala, is a prosperous commercial centre with stretches of cashew plantation. The place is also home to some fine relics of the past. 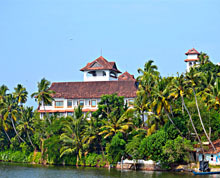 Overlooking the beautiful Ashtamudi Lake, Thevally Palace was built between in the first half of the 19th century during the reign of Gauri Parvathy Bai. It served as the residence of the rulers of the erstwhile Travancore princely state, when they used to pay visits to Kollam. 5 Km from Kollam, Thangassery was a colonial settlement which came under thee control of the Portuguese, then the Dutch and finally the British in 1795. A famous trading centre in the colonial era, Thangassery is home to the ruins of the fort built by the colonial power and churches. Built in 1519 The Thangassery fort has been declared a monument of national importance by the Archaeological Survey of India. The 144 feet high lighthouse, built in 1902 by the British, is open to visitors from 10 am to 5 pm. 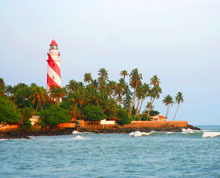 From his tallest lighthouse on the Kerala coast, one can have a majestic view of Kollam city and the surroundings. Regular buses ply from Kollam city to Thangassery. 6 km from the Kollam city, Thirumullavaram beach is a secluded and beautiful beach and has been a favourite haunt of tourists and locals alike. The currents can be strong sometimes. 10 km from the Kollam city, Mayyanad is famous for its nine temples. The most important of them is the Subramanya shrine at Umayanallor. The shrine is said to have been consecrated by the great Hindu scholar and saint Adi Shankaracharya in the 8th century. Mayyanad is well connected by rail with many important cities and places in Kerala. Air: Thiruvananthapuram, 71 Km away from Kollam, is the nearest airport connected with major cities in India. 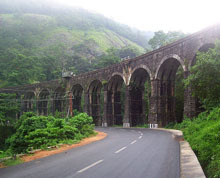 Road: Kollam is well connected by fine mototbale roads with different places and cites of India. Some of the cities and places connected with Kollam are Thiruvananthapuram (72 km), Alappuzha (87 Km), Kottayam (106 km), Kollam (150 km), Kanyakumari (160 km), Kaladi (187 Km), Thekkady (220 Km), Thrissur (229 km), Idukki (239 Km), Sabarimala (177 Km), Guruvayur (258 Km), Munnar (282 Km), Palghat (310 Km) and Kozhikode (372 Km). Ferry services: Located in close proximity to the central bus station the ferry station is 3 km from the Kollam railway station. Backwater Cruises: Alleppey Tourism Development Council (ATDC) & District Tourism Promotion Council (DTPC) operate backwater cruises (8 hrs) from Boat Jetty, Kollam to Alappuzha. DTPC also operates exclusive house boat holiday packages, pleasure boating in Thenmala Lake. Aquaserene, Hotel Sudarshan, Hotel Railview, Vijaya Palace, Club Mahindra Ashtamudi Resort, Fragrant Nature Resort, Sarovaram Ayurvedic Backwater Resort & Spa, Nila Palace, Lake Sagar Resort, Hotel Sea Bee, Palm Lagoon Resorts, Vijaya Castle, Shah International, Kadaltheeram Hotel, Hotel Ramkamal Residency, Hotel Comfort Regency, Hotel New Excellency, Green Channel Backwater Resort, Hotel Ambadi, Hotel Karthika, Safire Tourist Home, Shine Tourist Centre and Sika Lodge are some of the accommodation facilities in Kollam.